Maj. Gen. David Hogg, deputy commander-Army, NATO Training Mission - Afghanistan provided some great insight into the current NATO efforts with the Afghan Army training, including their current status, plans for future builds, and the many challenges they face. His responses to the Roundtable questions were especially informative and helpful in understanding the current situation within the Afghan Army. If we are to win the hearts and minds of the Afghan people their Army must be well trained and support the government security programs. This will be necessary before we can disengage and allow the Afghans to maintain their own security programs and provide opportunities for their people to become educated and prosperous. Gen Hogg has been in Afghanistan for 9 months and has oversight of training programs including combat forces, logistics, medical, infrastructure and equipment. The Afghan Army currently has 104,000 trained personnel in uniform with 17,000 basic trainees in the regional schoolhouses. The end strength goal for October 31st this year is 134,000. By the end of the following year (October 2012) the Ministry of Defense goal is to have 171,600 in uniform. Currently, there are 20,000 personnel in training including the basic trainees. The additional 3,000 slots are for officer training, NCO training, aircrew and the commando training program which is similar to our Ranger training. The commando training program has been very successful and is partnered with Army Special Forces teams. The aircrew training is for MI-17 helicopters and C-27A aircraft and requires English training as well. Due to literacy issues the basic course has two weeks of reading/writing so they can write their names, recognize the number of their weapons and other basic military needs. Gen Hogg said that education is a “big deal” to them. The Defense Language Institute is providing English language training as well. The Afghan Army now has a four year military academy and graduates 213 officers in March. 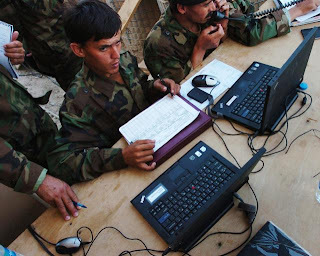 The development of an officer and NCO leadership track is critical to the Afghan Army success. Their personnel system is a challenge according to the general. One challenge for training is to transfer Afghan trainers from combat units with current experience back to the schoolhouses. Progress is being made and the Afghan leadership understands how this will help improve the performance. During the current push into Marjah there have been no incidents of non-performance by the Afghan Army and with the right leadership they perform admirably. The general said they will be following up with a lessons learned program after the current operation to use in Afghan training programs. One controversial program mentioned in the media, the re-integration of the Taliban into the Army has not happened and no program is in place to do that, the general said in response to one blogger’s question. However, Gen Hogg said this will be a high level decision before the training would start. They do have a training program for former mujaheedan fighters that has been successful! One aid to successful recruiting efforts has been the increase in pay for soldiers. In December, the basic pay went from $45 to $165 a month with combat pay increasing to $75 in red zones and $65 in yellow zones. The zones are levels of combat risk. One blogger quoted General McChrystal and said that the Taliban were being paid $300 a month and the general said they were not competing in pay. He emphasized that the recruits were primarily interested in supporting their families and that the medical program for the active soldiers included their families! He called them “highly motivated recruits” who state their reason for joining the Army is to serve Afghanistan! One key challenge the recruiters and Army face is the ethnic mix in Afghanistan. With a high percentage of Pushtans and Tajiks the effort to balance the Army to reflect the national demographics is critical and is part of the challenge the personnel system mentioned earlier. This is a very sensitive issue for all Afghans and they must do a balancing act to maintain a unified force. In a form of affirmative action they have metrics and goals for the different ethnic groups. In particular they need to grow the presence of Pushtans from the southern part of the country. I took away from this Roundtable that the training programs are in good hands and the success of the Afghan Army in developing leadership will determine the end result of these efforts. The senior leadership that has purchased positions through graft needs to be moved into greener pastures and allow the younger officers to be promoted. The development of a retirement system will help make this happen according to General Hogg. Great information general and thank you so much for taking the time for this great update for the Roundtable! If you would like to listen to an audio of the Roundtable or read a transcript please go to DoDLive! 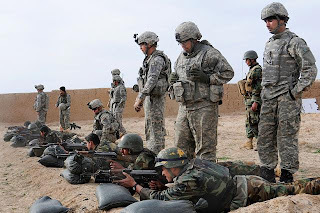 Two recent blogs I wrote about the war fighters in Afghanistan include: The "Can Do" Seabees in Afghanistan - DoD Roundtable and Supporting Our Troops in the Field - DoD Roundtable.